​Last year, the third sold out edition of Encore Festival made your summer hotter than ever. 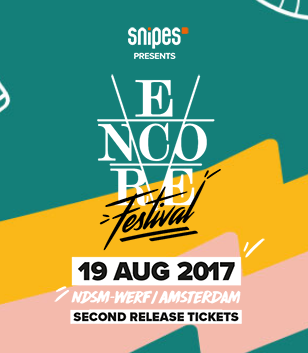 We know you want more so Encore Festival is back! Just like last year we will transfer the atmosphere and style of our weekly club night to an outdoor location, NDSM-werf, in Amsterdam. We present you a wide variety of live performances and the best national and international DJs. This will without a doubt be the best way to top off your summer. The previous editions of Encore Festival were insane with acts like Rae Sremmurd, Kid Ink, A$AP Ferg, Pusha T, Vic Mensa, Ty Dolla $ign, DJ Jazzy Jeff, DJ Mustard, Tory Lanez, Kehlani, Joey Bada$$, Metro Boomin, Sevn Alias, WSTRN, MHD and Lady Leshurr. This year’s line-up will easily match or even excel in comparison to last year and the names are online now. You will not be disappointed! Tickets are available online only through Ticketmaster.nl and Melkweg. We advise you not to buy tickets from any other website since it will certainly be overpriced and you might get scammed.